This morning Trax staff and a visiting researcher met with some farmers who described the ways they are experimenting and innovating. The farmers, both beneficiaries of the Trax project, explained that they are experimenting because they need to find a way to secure a harvest and income despite drought. 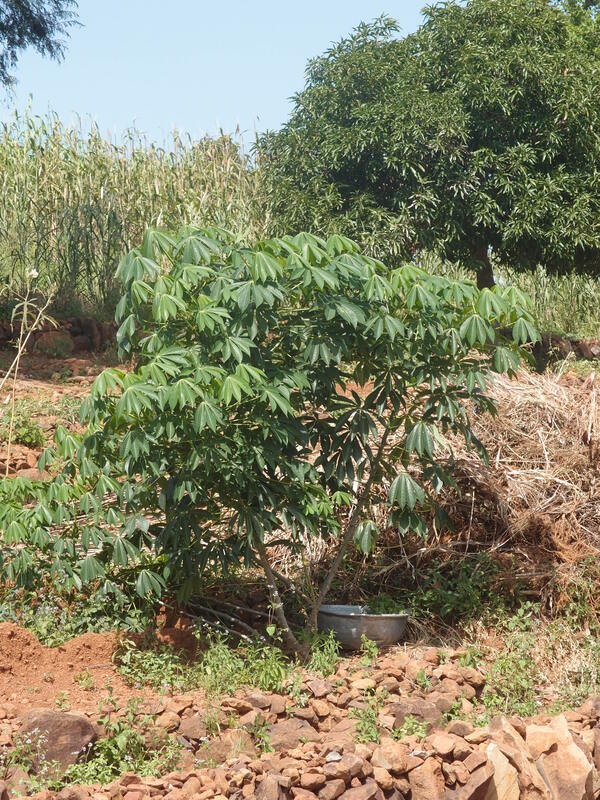 In Dussi, one farmer has this year trialled growing cassava. He was unsure whether it would grow well in his soils, particularly because he is farming on a hillside. He only planted a small amount of cassava to test whether it grows well on his farm. This means that he had a low risk of trying it because he did not need to put in much labour to test it. The cassava he planted has grown very well so now he knows that this variety can yield well on his farm he plans to plant a larger area with cassava next year. Growing cassava is part of a larger adaptation strategy employed by this farmer. He is intentionally diversifying his crops, thus his interest in adding cassava to the crops he farms. He is particularly interested in crops which yield at different times of the year. At present he has crops which are harvested at intervals which cover the whole year. Growing crops that harvest in a cyclical nature means that the family has income throughout the year. Another farmer, in the community of Pelungu, has trialled an introduced variety of jasmine rice this year. 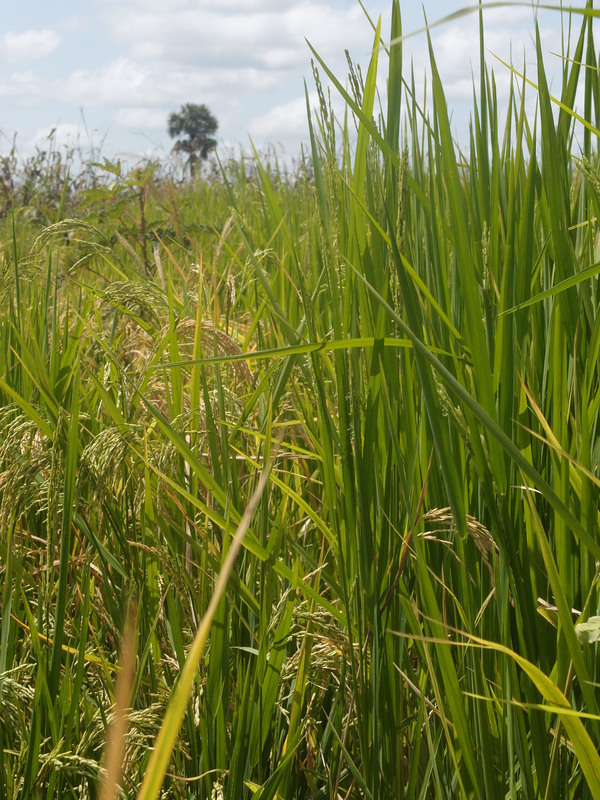 As it is a trial he has grown an area of the native rice variety which he grows every year. Alongside the native rice he has grown a small area of the introduced rice so that he can compare them. Again, by growing only a small area as a trial he does not risk loosing much should the new variety be unsatisfactory. The native rice was planted four months ago and is not yet producing heads of rice. However, the jasmine rice is a dwarf variety, meaning it is short in height so does not take as long to grow. The jasmine rice was planted three months ago but due to it’s shorter growing period it has already produced heads of rice and will soon be ready to harvest. Two varieties of rice growing side-by-side. Right: the native variety which was planted in June and is not yet producing heads of rice. Left: the introduced jasmine variety which was planted in July and has heads of rice. The farmer is happy with how the introduced jasmine rice variety has grown and plans to keep some of the seed stock so that he can re-grow it next year. He is just hoping that it cooks well and can be used within the traditional Ghanaian dishes. These are just two examples of farmers who are innovating along with the natural resource management practices they have been trained on under Trax’s project activities. Farmers are finding many ways to respond to challenges they face and to reap benefits from opportunities. This year a particular concern has been responding to reduced rainfall and a shorter wet season because this has been the second year in a row that has seen drought in the early wet season. This entry was posted in Agriculture, Climate change, News Update and tagged Adaptation, Cassava, Clmate, Experimentation, farming, Innovation, Rice, Trax Ghana, Trial. Bookmark the permalink.